Winner of the Abraham Lincoln Institute of Washington’s 2019 book prize! Abraham Lincoln and Winston Churchill, as commanders in chief, led their nations to victory—Lincoln in the Civil War, Churchill in World War II. They became revered leaders—statesmen for all time. Yet these two world-famous war leaders have never been seriously compared at book length. 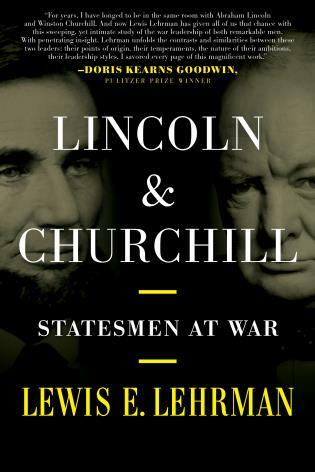 Acclaimed historian Lewis Lehrman, in his pathbreaking comparison of both statesmen, finds that Lincoln and Churchill—with very different upbringings and contrasting personalities—led their war efforts, to some extent, in similar ways. As supreme war lords, they were guided not only by principles of honor, duty, freedom, but also by the practical wisdom to know when, where, and how to apply these principles. They made mistakes which Lehrman considers carefully. But the author emphasizes that, despite setbacks, they never gave up. Even their writings and speeches were swords in battle. Gifted literary stylists, both men relied on the written and spoken word to steel their citizens throughout desperate and prolonged wars. Both statesmen unexpectedly left office near the end of their wars—Lincoln by the bullet, Churchill by the ballot. Lewis E. Lehrman received the National Humanities Medal for his work in American history. He has written for the Washington Post, New York Times, Wall Street Journal, National Review, and Harper’s, The Churchill Project at Hillsdale College. His previous books include Lincoln at Peoria and Churchill, Roosevelt, and Company. His other work in history includes cofounding the esteemed Lincoln Prize for Civil War scholarship, the Gilder Lehrman Center at Yale, and the Gilder Lehrman Collection at the New-York Historical Society. A graduate of Yale and Harvard, Lehrman has been awarded honorary degrees from Babson College, Gettysburg College, Lincoln College, Marymount University, and Thomas Aquinas College. He lives in Greenwich, Connecticut.